Did you know that the automobile is the single most recycled consumer product in the United States? Currently, almost 100 percent of automobiles get recycled in the United States. The US automotive recycling industry is a crucial, market-driven industry with over $32 billion in annual sales. The industry employs more than 140,000 people at over 9000 locations across the country. People with junk cars take them directly to a scrap auto business or trade them in at an automobile dealership, but eventually, they end up at an auto wrecker for recycling. At the wrecking yard, all the reusable parts of a vehicle, including wheels, windows, trunk lids, hoods, seats, and doors are removed. At the same time, for environmentally responsible recycling, mercury switches are removed, and cars are drained of fluids. The remaining hulk of the car enters the shredder. Then, it gets ripped into fist-sized chunks of nonferrous metals, steel, and fluffs (non-recyclable plastics, glass, rubber, etc.). The steel and iron are magnetically separated from other contents and recycled. Then, the metal scrap is shipped to steel mills where it is used to produce new steel. Some metal scrap goes to secondary processors (often scrap brokers) as well. Every year, more than 18 million tons of steel from automobiles are recycled by the steel industry. Approximately, 86 percent of a car’s material content is recycled, reused or used for energy recovery. About 60 percent of a passenger vehicle consists of steel and iron. The steel used to make a brand new car contains at least 25 percent of recycled content. Recycled steel from old car is used to make car shell, hood, trunk, door, and quarter panels. 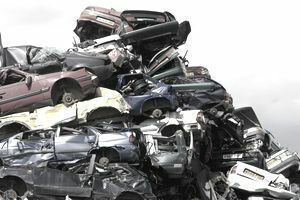 The auto recycling industry is a vast industry with high demand for End of Life Vehicles (ELV) in both auto manufacturing and steel industry. The CEO of the Automotive Recyclers Association (ARA), Michael E. Wilson, believes the opportunities for and the importance of the automotive recycling industry are ​both growing exponentially. These days, junk car owners have multiple options of selling their junk cars for cash. They can sell their junk cars on Craigslist, eBay and also directly to scrap yards and automobile dealers. At the same time, scrap yards and automobile dealers compete for EOL vehicles offered on Craigslist, eBay or directly from junk car owners. Businesses need to ensure they are equipped with latest technologies in the industry and maintain standards of auto recycling practices specified by ARA. The auto recycling industry is not devoid of challenges. Businesses need to ensure they are equipped with the latest technologies in the industry and maintain standards of auto recycling practices specified by ARA. Three of the biggest challenges for the sector include education and training, insurance, and salvage. It is always hard to find good, skilled labor for an auto recycling facility. So, businesses need to hire new labor and train them for a long time to make them competent in the field. Until and unless the company has a well trained and skilled labor force, the overall efficiency will be diminished. Insurance is another significant challenge as the number of businesses that provide workers’ comp insurance in the industry is low at the moment. Finding reasonably priced salvaged vehicle is another challenge for firms in the sector, as many old cars are exported while more are purchased by unscrupulous buyers who will pay almost anything to get them. Increasingly, auto recyclers are employing more sophisticated marketing and customer service approaches to improve their inflow of old vehicles. Such methods are designed to make it very easy for owners to get cash for their clunkers and have them quickly take away. Junk Car Medics is a company that has created a national brand, operating in more than 53 locations across the United States. Medics work with auto salvage yards across the country. The company buys junk cars for cash, process them and sell steel, nonferrous metals and other contents to steel mills and manufacturing businesses that can use them to produce new products. In the process, the reusable car parts get separated and sold to automotive repair centers. There is a Cash For Junk Car Form on their website which needs to be filled and submitted to get an offer for any junk car a customer may have. Once the form is filled and submitted, Medics contact the client right away and make an offer for the junk car. Once the customer accepts the offer, Medics dispatch a tow truck to deliver the customer the cash for the junk car and provide free junk removal. Junk car owners can also make a direct call to Medics and get a quote for their vehicles. As the industry moves towards higher levels of customer service and greater ease of recycling, this approach assures more efficient recycling and resource recovery. The article was contributed by Junk Car Medics. How Do We Increase Metal Recycle Rates to Reach Sustainability?